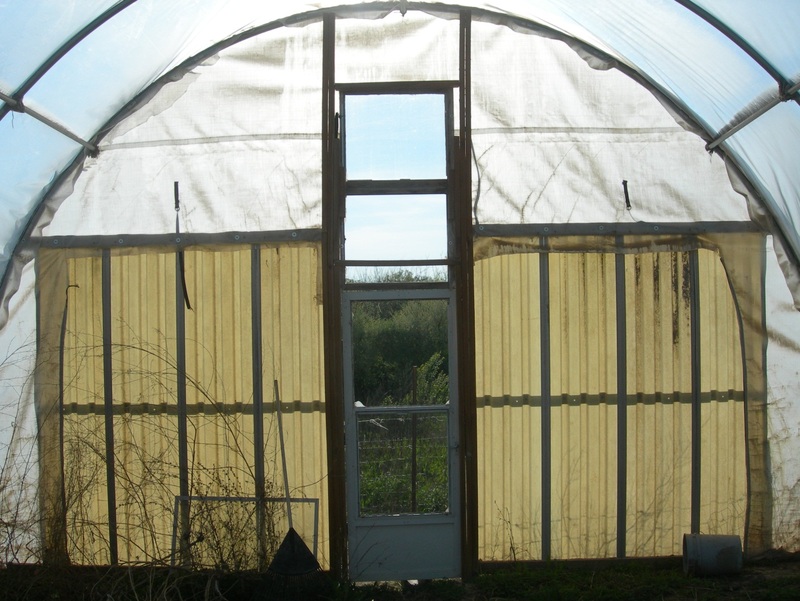 Why a sane person build a hoop house, covered in plastic, in a place as windy as Dahinda, Illinois? We ask ourselves that. A combination of keeping up with the Joneses of the area’s local food scene and wanting a year round source of fresh produce piqued our interest in a hoop house. A grant from the Department of Agriculture sealed the deal. So with a catalog from Farm Tek and a promise of help from several friends we planned to put up a 40 ft. X 20 ft. hoop house. We forged ahead ignoring the warning that the winds were giving us having faith that we would be successful. We were, sort of, and we learned a lot along the way as well. Illinois is renowned for its flatness. The Wisconsin pejorative for Illinoisans, “flatlanders” does have some credence when one drives across most parts of the state. There is an exception to every rule though and for a flatlander it is found in an area running from approximately Bloomington west/ northwest to the Galesburg area. This strip of land running just north of the Interstate 74 corridor, has many hills, deep valleys, and winding roads making the area look more like you are in the foothills of the Appalachians than any region of Illinois. Some of the hills, such as the one my farm sits on, are very scenic, offering views into valleys that stretch for miles. But combine the winds Illinois is also famous for and the unbroken access the winds have to a hilltop farm and in hindsight it seems like we should have though it out more. But we went ahead wind notwithstanding! I ordered the hoop house and since the company delivering the hoop house would only deliver to a place with a loading dock, the order was delivered to a local farm services company that my neighbor worked at. After picking it up and unpacking the parts I set about to assembling my new hoop house. The frame went together in a snap. One other thing to consider in hoop house assembly is finding a very level place to build it. After checking several areas we decided on a place. After putting together the pipes that make up the frame, it was easy to put them upright. 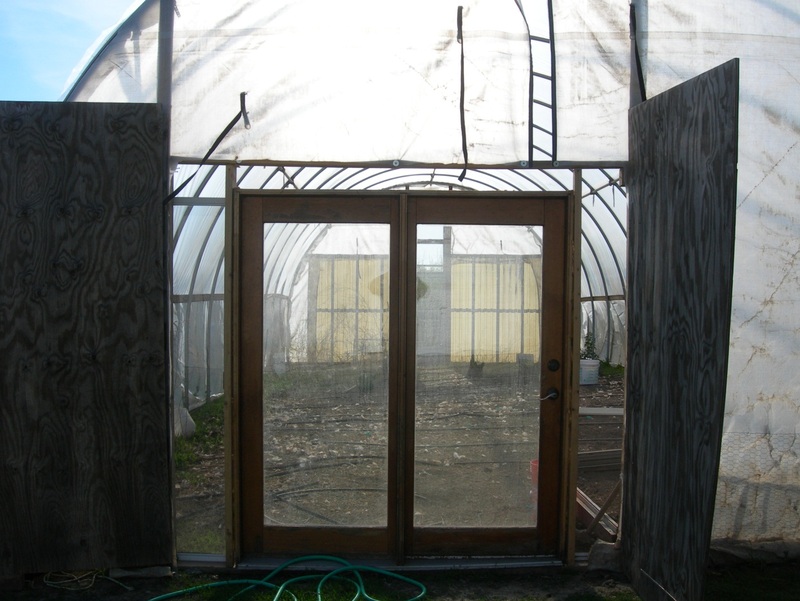 The two sides were made of a tough material that had zippers installed so they acted as doors for the hoop house. These were pretty easy to install but this also gave me the first hint of what was to come. Standing on a ladder while trying to hold the material a stiff wind whipped up and I felt like I was up on the mast of a ship during a storm. Luckily I was able to attach the side to the frame before I blew away! Then came putting the plastic cover on. Several friends helped on a day that seemed to be wind free. We tied rope to the plastic, as per the instructions, threw the ropes over the frame and started to pull the plastic over. Of course, at this point, the wind again whipped up and we all nearly took a kite ride! Several attempts at throwing the ropes over and pulling the plastic over failed but eventually we were able to pull the cover over and secure it with the spring clips and tracks that are used to hold the plastic in place. At this point, there was no damage to the plastic or the sides. There was an assembly for a crank up side vent system that would open the sides up 4 feet to allow for ventilation. There are bottom pipes, 40 feet long, which run along each of the longer sides of the hoop house. We did attach the bottom of the plastic to these pipes assuming that I would be able to get to the rest of the system later. The next day, after coming home from work, the wind was in its usual 40 mile an hour howl and both of the 40 foot pipes had ripped off of the plastic with one laying near our barn 50 feet away! The bottom of the plastic cover was so damaged that I put off even trying to install the rest of the ventilation system. The hoop house walls, below the 4 foot area for the vent system, were now flapping wildly on the wind. The hoop house looked like it had wings! My father in law and I were able to keep the bottom of the hoop house from flapping by using the 40 foot pipe and some fence posts pounded in to secure the pipes. We just wrapped the plastic around the pipe to secure it. The two sides were next. The zippers for the flaps worked fine at first but the wind from day to day began to take its toll. Keeping them closed made the entire hoop house move back and forth like it would soon be ripped out of the ground. Keeping them open negated the point of the hoop house, since this was March and we wanted to grow early vegetables. We decided to keep the zippers open and secure the sides with the straps that came with the product. This proved to be totally ineffective as the wind worked the straps until they were loose and the sides flapped violently. Soon they were tearing and I had to replace them. I cut up an old translucent garage door into 6 foot sections and secured them to one side of the hoop house. I also installed some windows and an old screen door to this side. I cut away the old side material and attached the rest to this assembly. The wind over time has blown out the windows and this past winter it blew out the Plexiglas windows in the screen door as well! I replaced all of the windows several times. On the other side, we are beginning to install several patio doors we bought at the local annual church auction. These seem strong but who knows what the wind has in store for these. The news is not all bad though. The hoop house has provided up with a place to grow early lettuce and other cold weather crops. It has also allowed us to actually grow eggplant. Our previous attempts to grow eggplant at our farm here in Dahinda, Illinois had been met with failure. The flea beetles are so bad, and apparently crave eggplant leaves so much, that the leaves looked like some kind of lace artwork! Other crops are not so affected by flea beetles but the eggplant would just die off before setting any fruit. Once we put them in the hoop house the extra heat seemed to repel the flea beetles and the eggplant thrived. I have grown about 10 different varieties of eggplant in the hoop house and all have thrived. 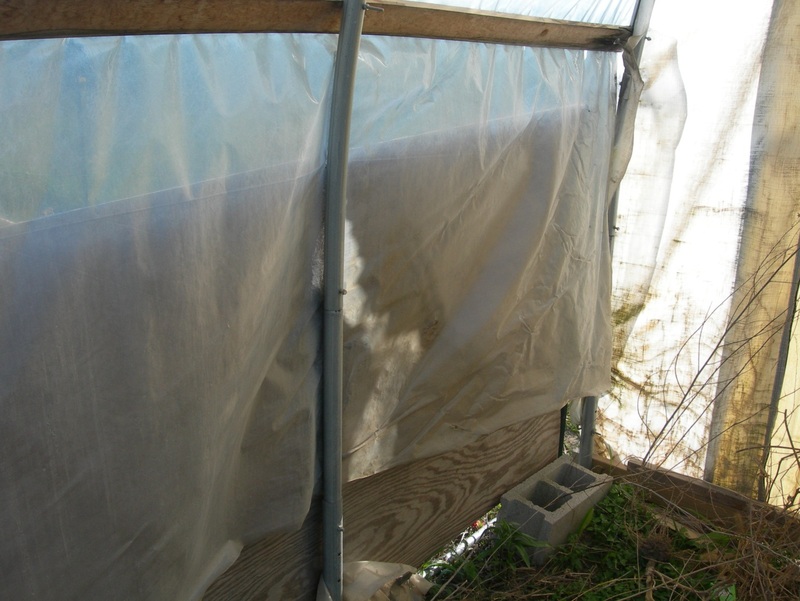 Several years after building the hoop house, the main body of the plastic cover has held up pretty well considering what has happened to the rest. The area that was to become the vent system it very much in tatters and the vent system may never be installed. The sides are an ongoing project and I am expecting more damage in the future. We have been able to use the hoop house but the repairs we have made, along with the extra work, have eaten away any gain we made from the USDA grant we received to build the project. If there is one nugget on knowledge that I have taken away from this whole experience is to advise anybody to not build a hoop house in a very windy area! The wind sure created challenges and caused problems. This seems like it would be a problem in many areas.